What a day! I decided to let the crew have their one and only sleep in, as we were to be joined by our latest crew member Simon who flew in to Cairns at 9 am. We pulled up to the free parking station in the 2 minute zone at the airport to some very polite traffic controllers who only stopped chatting when they had to move other lingering vehicles on! They are so friendly up this way! Then we took off up towards Port Douglas for lunch. 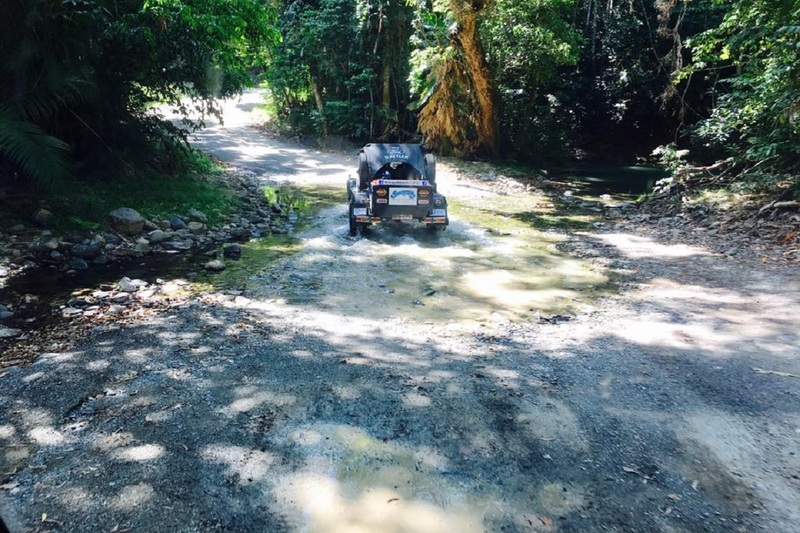 Soon we were on the road to the Daintree Ferry, heading towards Cape Tribulation and the Bloomfield Track, most inappropriately signposted as for ‘4WD’s only’! On the Track, I experienced the steepest ascents and descents I have ever travelled on a public road, even more so than the Alpine passes from the Peking to Paris Rallies. The Track was so steep that the 87 y.o. mechanical brakes in The Rattler, overheated and became ineffective, and even with the engine in first gear and under maximum revs it was time to look for a run off half way down the slope! Boy oh boy, was I lucky that there was one. When I had a casual glance down the side of the hill, I saw an old wreckage of someone who wasn’t so lucky. We did a brake adjustment and reduced the air pressure in the rear mud fats, and set off to descend the other half of the hill! After leaving the Track, we were back on the black top and headed for Lakeland. There was a distinctly sharp contrast between the lush tropical coastline and rainforests and the dry Aussie bush further inland. Upon arriving in Lakeland, we all carried out maintenance and repairs to the fleet. The Rattler needed new fuel filters and the trailer had two new wheel hubs fitted to it, purchased in Cairns just in case the hubs failed, which they did! All in all, everything is going really well so far and we aren’t planning on that changing any time soon!! Tomorrow we head off, straight up the centre of the Cape, bound for Archer River.